The latest cold front has come breezily into town. 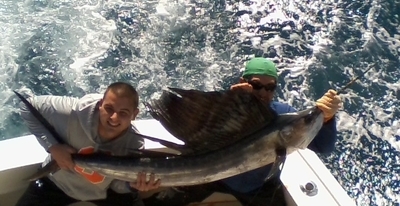 The seas are up, the temperature is down, and the Winter Sailfish season seems to be on as Ft. Laudedrdale fishing was all about the Sailfish today. Hard and even harder gusts from the northwest and then later in the day due north had a good number of Sailfish moving through our area. A slight north current pushing against that northerly wind had some fish up on top and tailing as they pushed their way to the south. Singles and small bunches of adult fish pressing into the current. These fish were for the most part in the greener water instead of the deeper blue water which put them inside a blue water edge and the stronger current there. Good number of fish seen and a live bait seemed almost a must today to draw a finicky bite. As this expected wind swings more to the east we are hoping for less seas than in the initial forecast, which is what happened earlier this week on the previous frontal system. That remains to be seen as the system moves through tomorrow with strong winds predicted. IWe are expecting some good fishing more than hoping for it. But we are hoping for the wind to fall out somewhat rather than expecting the wind to just fall off. We’ll see. These fish will be moving fast if the wind stays up and northerly. Numerous species ride these stronger fronts and head south and the ever popular Mahi should be available among others. We and many other anglers look forward to the next couple of days to see what Mother Nature brings to our doorstep.